Airedale Terrier puppies and dogs are lively and intelligent by nature with a sensitive spirit and a strong desire to please. These dogs are very intelligent and responsive, making a loyal family pet or good companion for older children. This breed requires a strong and confident owner who can blend firm discipline with patience and precision. Airedale Terriers will generally get along well with household cats and other animals but may sometimes try to dominate other dogs. They need to feel love and respect from their other family members as well. To ensure a better temperament from your Airedale Terrier, choose a reputable breeder. 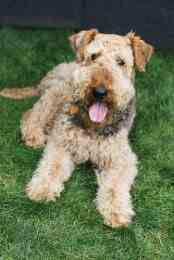 Airedale Terrier puppies and dogs come from a non-shedding breed. Their coat is double layered featuring a hard, dense and wiry outer layer covering their soft undercoat. This breed can have minor health concerns that should be noted. Airedale Terrier puppies and dogs may be afflicted with eye problems, skin infections or hip dysplasia. With an athletic physique, the Airedale Terrier makes a good jogging partner. This breed excels in hunting, agility, eyesight and hearing making it an active, fun loving animal. These dogs are sturdy, well-boned and well-muscled so they desire a fenced yard with ample running space. Airedale Terrier puppies and dogs are not recommended for apartment life and may become destructive if not given enough exercise from an active owner. Airedale Terrier puppies and dogs are responsive and not difficult to train making them the easiest of all the terrier breeds to train. They do not respond well to harsh training methods and should be given proper obedience training.